Are you looking for the perfect gold necklace to pamper yourself with or do you want to give your beloved a beautiful gold pendant with a brilliant cut diamond? You will surely find the perfect diamond necklace in our extensive collection. You can also pick out a beautiful diamond pendant to go with your necklace. Or if you are looking for something truly special, maybe our diamond lockets are your cup of tea? What length are the BAUNAT necklaces? The BAUNAT necklaces for women come in various different lengths. The typical length of a necklace (with or without diamond pendant) varies between 35 and 90 cm. The shortest type, called a choker, is worn tightly around the neck; the longest necklaces are called ‘ropes’ and these can be layered for a truly stunning effect. You will find necklaces of many different lengths in the BAUNAT collection. This way, you can choose a platinum or gold necklace that suits you perfectly, taking into account your personal clothing style and body type. Where do necklaces come from? Necklaces have been worn for centuries. The oldest necklace ever to be found by archaeologists was approximately 75 000 years old. It is clear that throughout the centuries diamond necklaces and pendants have become an staple piece of jewellery for every woman. Which diamond necklaces are ideal as gifts? 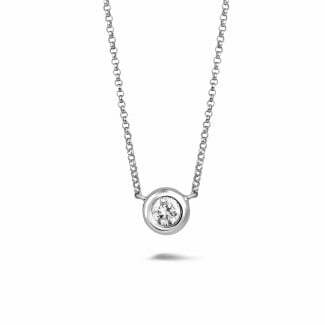 If you are looking for a birthday, Mother’s day, Christmas or Valentine's Day gift, you should definitely browse through our extensive collection of diamond necklaces for women. The main advantage of diamond necklaces and diamond pendants is that they are very versatile. 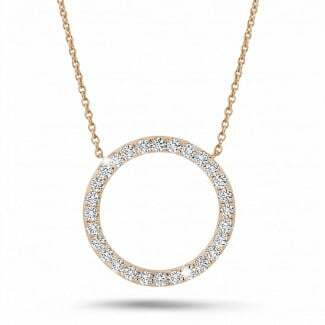 A dainty diamond necklace is always a good choice and safe option. But if your loved one prefers something a little bit more striking, you can easily find a necklace for that as well. A stunning and highly detailed diamond necklace is most certainly an original and wonderful gift. The jewel par excellence to gift your loved one is perhaps a personalised necklace. A beautiful necklace with a personalised pendant, made from red, yellow or white gold and set with colourless, round diamonds. What are possibilities if I want to create a tailor made gold necklace with diamonds? Which settings can I choose from for my diamond necklace for women? Be sure to consult the diamond jewellery experts at BAUNAT.